The Centre for Climate Change Management is located on the fourth floor of The Joyce Centre for Partnership & Innovation. Within the 6,500 SF, $2.4 M project, we designed an open workplace with the sole purpose of enabling creative collision between partners. The Centre is comprised of a partnership between the City of Hamilton, the City of Burlington and Sustainable Hamilton Burlington. Completed in 2019, the Centre provides an important connection, both visually and physically with the region’s future net zero workforce and the work being done at Mohawk College through the innovative Net Zero Certified facility. 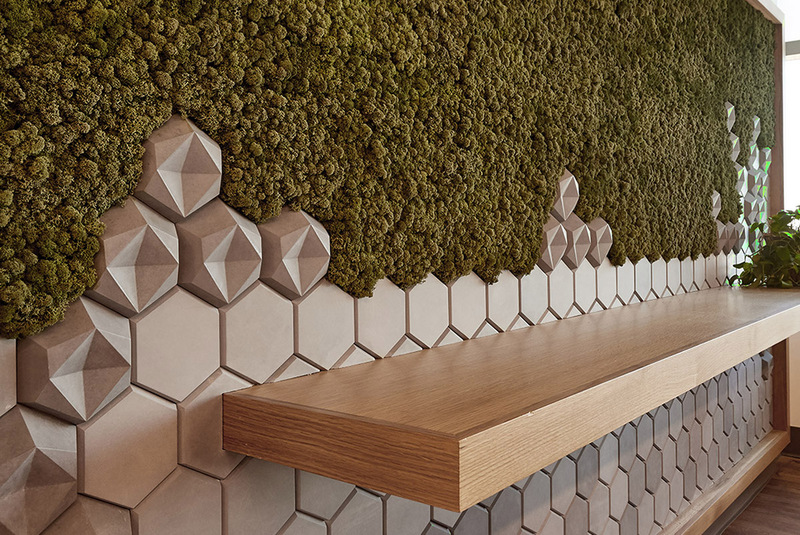 What instantly speaks to the Centre’s sustainable mission is a textural moss wall that greets you as you enter the space. The natural piece is both an artistic statement while doubling as acoustic control. The backdrop of the offices is a rooftop garden, punctuated by the large structural trees which hold the photovoltaic panels that make The Joyce Centre for Partnership & Innovation so distinct. The office has generous vistas of the entire City from both sides, on display to their full advantage in the reception, waiting rooms, boardrooms and kitchen. 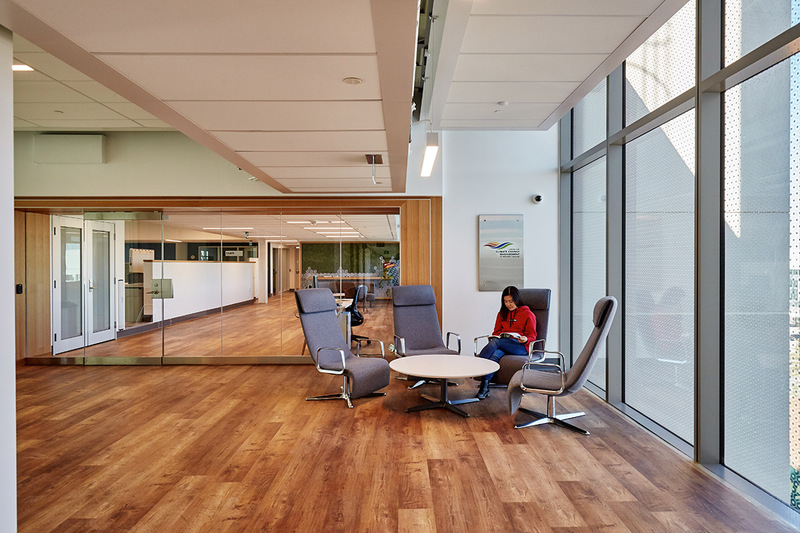 It floods the space with natural light which supports the building’s automated controls, helping to achieve its ambitious energy reduction targets. Home to initiatives such as the Bay Area Climate Change office, the Industry Partnership Initiative, Campus Carbon Management Initiative and Office of Campus Sustainability and Climate Change, transparency and connection are key. 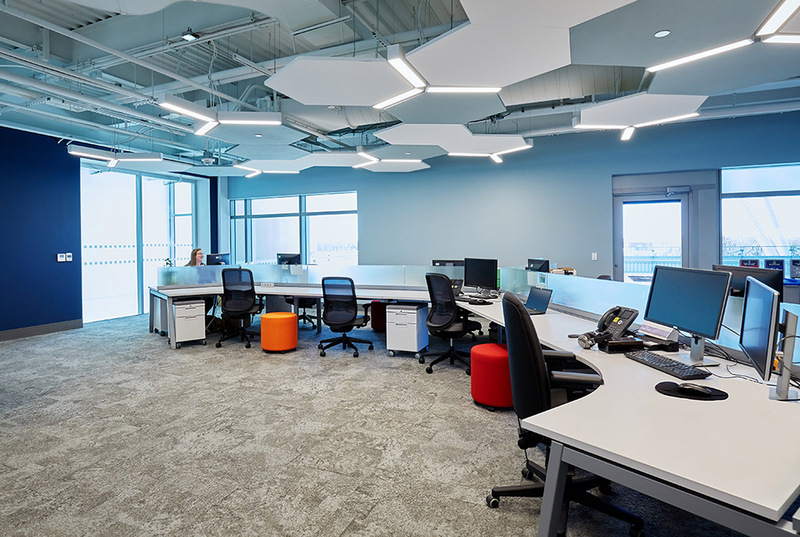 Offices are replaced with zones, including a large open dedicated work area and large moveable white boards filled with evidence of the collaborative brainstorming enabled in the space. The environment has become a visual symbol of Mohawk College’s connection with business partners and community initiatives within the broader community, a connection central to its mission.